Corticosteroids may unpredictably trigger pheochromocytoma crisis (PC). However, there are limited data so far on the mechanisms of sporadic chromaffin tumor cell steroid reactivity. We report the case of a 73-year old man, who developed PC after receiving oral dexamethasone. We documentincreasedglucorticoid receptor (GR) expression in the patient’s pheochromocytomaas compared to normal reticularis and chromaffin cells. These results providea potential explanation for corticosteroid-induced PC and suggest that increased GR expression may characterize a subtype of steroid-sensitive pheochromocytoma. Given the often poor outcome of pheochromocytoma crisis and the widespread use of glucocorticoids, we discuss the clinical implications of our findings. Pheochromocytomas are catecholamine-secreting neuroendocrine tumors that may present with life-threatening cardiovascular complications as a result of massive release of excess catecholamines into the circulation, the pheochromocytoma crisis (PC). These emergency situations may occur spontaneously or be triggered by mechanical factors or drugs, and warrant prompt recognition and intervention as they can lead to multiorgan failure and death[1-3].Although corticosteroids have been implicated in triggering PC,the mechanism remainsunclear. The present report describes a case of unsuspected pheochromocytoma, presenting with an adrenergic crisis following dexamethasone administration,together with the analysis of glucocorticoid receptor expression ofthe tumor cells, providing potential insight into the pathophysiologyof this unpredictable and dramatic clinical event. A 73-year-oldman presented to the emergency room with an acute onset of non-specific mild epigastric discomfort with nausea, vomiting,orthostatic dizziness and palpitations. He denied diarrhea, fever, chills or any other symptom suggestive of an acute infection. He had no chest pain, dyspnea or neurological symptoms. He had no relevant past medical history, was previously active and asymptomatic and was on no regular medication. However, two days prior to presentation, he saw his dentist and underwent an elective curettage under local anesthesia for a low-grade infection of a dental implant. As a standard treatment for this condition, the patient received amoxicillin 500 mg three times a day, ibuprofen 400 mg every 4 to 6 hours and dexamethasone 4 mg daily for three days. Patient was on his third day of treatment when he presented to the hospital. Initial physical examination revealed an alert patient with a blood pressure of 107/51mmHg and sinus tachycardia at 126 beats/min.Capillary oxygen saturation (97%) and the temperature (37.7°C)were normal, as were the cardiac, pulmonary, abdominal and skin examinations. Following infusion of twoliters of normal saline, the blood pressure increased to 158/63 mmHg and the pulse rate slowed to 105 beats/min. However, when he stood up, his systolic blood pressure dropped to 60 mmHg and hispulse rose up to 140 beats/min. Laboratory results showed hemoconcentration(hemoglobin: 182g/L), an elevated white blood count (22.7 109/L),a normal platelet count, elevated serum creatinine (148 umol/L; normal: 58-110 umol/L) and slightly increased lactate levels (3.66 mmol/L; normal: 0.5-2.2 mmol/L).Serum potassium and sodium levels were normal, hisblood sugar was increased (10.3 mmol/L; fasting normal: 3.3-5.5mmol/L). Troponin level was elevated (175ng/L;normal: 0-14 ng/L) with only sinus tachycardia noted on the electrocardiogram. Chest X-ray was normal. Echocardiogram revealed a normal ejection fraction and no ventricular hypertrophy. Despite additional volume repletion, 48h after the patient’s arrival, blood pressure became extremely labile with systolic values ranging from 60 to 250 mmHg within 10-minute intervals. A 24-hour urine collection revealed markedly elevated levels of norepinephrine (13,685 nmol/d;normal0-426nmol/d), epinephrine (5,635 nmol/d;normal0-133) and their metabolites normetanephrine(4,566 nmol/d;normal 0-522nmol/d) and metanephrine(3,473 nmol/d;normal 0-266nmol/d).Serum cortisol was slightly elevated (1,253nmol/L; normal 60-545 nmol/L) and serum aldosterone/renin ratio was normal. 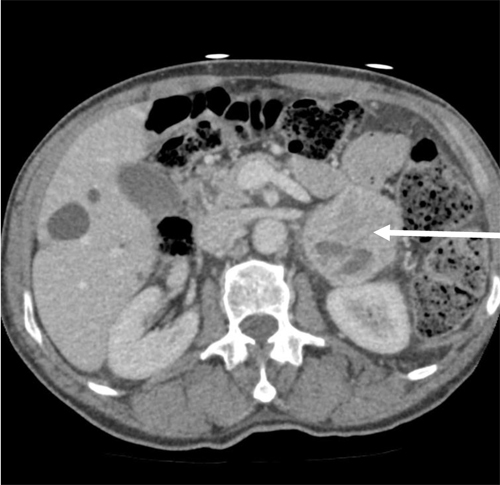 An abdominal CT scan revealed a localised 5 cmleft adrenal mass with a heterogeneous uptake of contrast, highly suggestive of a pheochromocytoma (Figure 1).Over the following days, continuous volume expansion and sequential introduction of the oral alpha-blocker prazosin and the alpha-beta blocker labetalol stabilized the patient’s clinical condition. A weeklater, while on low dose treatment (prazosin 1,5 mg QID and labetalol 50 mg BID), the patient was asymptomatic again and repeated measures of urinary levels of catecholamines(norepinephrine: 260 nmol/d; epinephrine: 255 nmol/d)and cortisol (251 nmol/L) revealed almost normal values. The patient underwent an uneventful laparoscopic adrenalectomy two weeks later. Pathologic examination revealed a 6cm by 5cm by 4cm hemorrhagicpheochromocytoma. The patient was discharged from hospitalon the third postoperative day, normotensive and on no medication.Four months later, urinary catecholamines and their metabolites were normal, an123MIBG (iodine meta-iodobenzylguanidine) scan and a PET (positron emission tomography) scan were negative for residual or metastatic tumour. The clinical course, as well as the documented transient massive release of catecholamine following administration of dexamethasone,strongly pointedto corticosteroidsas the trigger for the adrenergic crisis.Although few casereports have documented this association, no study specifically addressed the steroid sensitivity of pheochromocytoma cells. To further dissect the understanding of the pathophysiology of this subtype of tumor, we tested the hypothesis that glucocorticoid receptors (GR) may be overexpressed in these glucocorticoid-reactive tumors in comparison to adjacent tissue orin comparison to adrenal tissue from healthy patient. Whole adrenal gland, from the reported patient, was obtained immediately following surgery and was dissected to obtain a complete section of the pheochromocytoma as well as a section containing both pheochromocytoma and normal adjacent tissue. No normalresidual medulla was available. For comparison, a healthy human adult adrenal gland, of unknown age, was obtained from a renal transplant donor through collaboration with the Transplant-Québec Association and transported to our center on ice. This project was approved by the CHUS Ethics Review committee. Written informed consent was obtained from the patient. Upon reception, adrenal glands were fixed, embedded in paraffin, sliced and processed for immunohistochemistry. Following non-specific blocking,sections were incubated with the primary rabbit anti-glucocorticoid receptor antibody (GRM-20; 1:100; Santa Cruz Biotechnology, Santa Cruz, CA, USA) for 1h at room temperature. Omission of primary antiserumor replacement of the first layer of antibody with specific blocking peptide (Santa Cruz) added in a10-fold molar excess to the antibody, immediately before incubation, were used as negative controls. Sections were incubated with anti-rabbit biotinylated secondary antibody for 1h at room temperature, washed, and incubated with Vectastain Elite ABC reagent (Vector Laboratories, ON, Canada), followed by detection using the 3,3’-diaminobenzidine reaction. Counterstaining was performed using hematoxylinfor nucleus visualization. Slides were mounted in VectaMount non-aqueous mounting medium. Photomicrographs of entire sections (5905x4032 pix; 6.35 x 6.35 um/pix; 16 bit color) were captured with NikonScan 4.0.2 software using the Nikon Super CoolScan 9000 ED Film Scanner (Nikon, Melville, New York) equipped with medical slide holder FH-8G1. Images were taken using a 2,5X objective. Slides were also examined in bright field using an Axioskop 2 microscope (Carl Zeiss, Inc., Thornwood, NY). Photomicrographs of 1392x1040 pixels were captured using 40x or 63X phase-contrast objectives and Retiga SRV cooled color digital camera (Qimaging, Burnaby, Canada). All images were acquired using identical camera settings for contrast and brightness. Images were processed using Adobe Photoshop CS3. As illustrated in figure2A, the GR antibody produced specific labeling (Figure2A-1,2A-2,2A-3), which was completely abrogated following peptide adsorption (Figure2A-4) or omission of primary antiserum (not shown). In healthy donor (Figure2A-1,2B,2D), GR was moderately expressed throughout the adrenal cortex (Figure 2A-1), butwas mostly concentrated within the zonareticularis(Figure 2A-1,2B) in comparison to chromaffin cellsof the adrenal medulla (Figure2A-1,2D). In the pheochromocytoma section (Figure 2A-2,2C), staining was equally distributed throughout the section and intensively brownish in comparison to the patient’s normal adjacent adrenal cortex (Figure2A-3). At the cellular level, GR labelingwas cytoplasmic and/or nuclear, either in healthy donor or the studied patient (Figure2B,C,D).As camera settings were identical between images capture, it can be observed that GR expression was much more intense in cells from the pheochromocytoma (Figure2C) in comparison to normal reticularis (Figure2B) or normal chromaffincells (Figure2D). Figure 2.Immunohistochemical detection of glucocorticoid receptors in adrenal gland from a healthy donor and one having a steroid-induced pheochromocytoma. Adrenal glands were processed as described in Materials and Methods. Panel A, GR labelling of whole tissues section. A-1) Healthy donor.A-2) and A-3) studied patient; A-2) pheochromocytoma section, A-3) normal adjacent section.A-4) Nonspecific binding, as revealed by peptide adsorption of GR antibody. Images were taken with a 2,5X objective. Panels B-D: Magnifications of selected portion of healthy zonareticularis (B), healthy adrenal medulla (C) and pheochromocytoma (D). Magnified images were taken at 40X (scale bars= 10 µm), and inset at 63X. C:Capsule, ZG:ZonaGlomerulosa, ZF:ZonaFasciculata, ZR:ZonaReticularis, M:Medullo Adrenal, CC:ChromaffinCells. Although GR would expect a nuclear localization, nucleo-cytoplasmic expression of the GR was also previously evoked in rats . Since 1962, 25 isolated cases of presumably corticosteroid-induced pheochromytoma crisis have been reported[4-20].All these cases have been summarized by Barrett. et al in a recent literature review on the risk of adrenergic crisis following glucocorticoid administration in patients with adrenal mass. They reported three casesof PC after a high-dose dexamethasone suppression test for adrenal incidentalomaresulting in one death; there were no cases of PC aftera low-dose dexamethasone suppression test; there were 6 cases of PC after exposure to cosyntropinresulting in four deaths; and finally there were 16 cases of PC during therapeutic glucocorticoid administration for a variety of clinical indications resulting in three deaths. Pheochromocytoma was undiagnosed prior to corticosteroid administration forthe majority of these cases. Since corticosteroids arethe treatment of choice for many conditions, and as severalformulations and even ACTH,in a variety of routes of administration and doses have been reported to induce catecholamine excess, these agents should be used with caution given their potential to induce PC,a life-threatening endocrine emergency[4, 21]. Althoughthe exact mechanism of corticosteroid-induced PCis unknown, several have been suggested[4,9,12,13]. Steroids are known to potentiate the action of catecholamines on peripheral vessels and the heart, potentially leading to vasculopathy, tissuenecrosis and hemorrhage. These characteristics are in line with observations in the literature and in the present caseofhemorrhagic foci in steroid-modulated pheochromocytomas[4,5,9]. In support of this idea, a previous report documentedacute tumornecrosis and an increased pain and size of metastatic bone lesionsafter induction of a PC8h following injection of methylprednisolone,in comparison to a baseline scan 3 months prior. Diagnosis of corticosteroid-induced pheochromocytoma crisis mainly remains anecdotal and no mechanistic studies have been yet undertaken to further dissect our understanding of the pathophysiology of this condition. As the delay between administration of corticosteroids and onset of PC is very rapid, ranging from 1 to 72h, tumorsensitivity to glucocorticoidsis likely to bethe culprit.In support of this hypothesis, in two reported cases, adverse reactions tocorticosteroids were reproduced in the same patient, thus supporting steroids as a trigger for pheochromocytomaactivation[4, 6]. We were thus interestedin studying the expression of the glucocorticoid receptor (GR) in the case we present. While peripheral actions of glucocorticoids are well known, their local effectsand presence in the adrenal gland, and related pathologies, are somehow scarce, poorly detailed andequivocal. 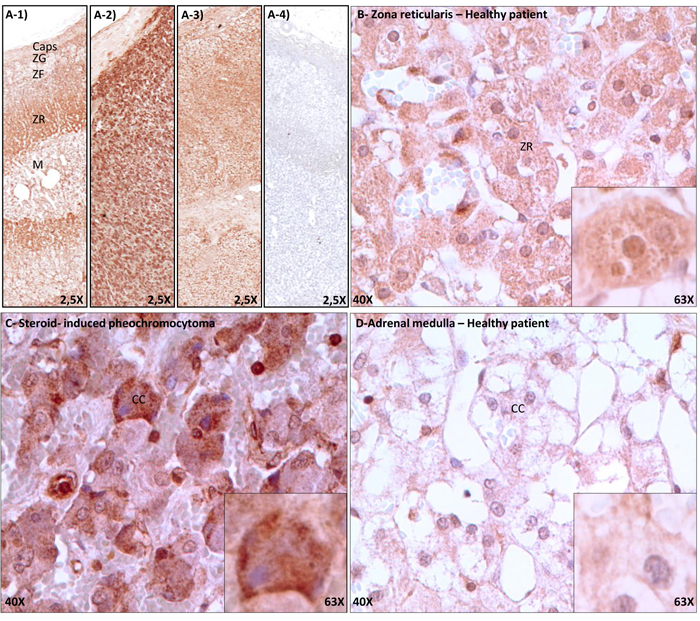 This study is the first study to clearly demonstrate a gradation of the GR protein expression between healthy donor adrenal gland medulla (faint), healthy donor adrenal gland zonareticularis (expressed) and tissue from a pheochromocytoma presenting with asteroid-induced crisis (highly expressed). Indeed, previous studies have shown that in healthy human adrenal glands, GR was expressed within the zonareticularisof the cortex but present at a very low level within the adrenal medulla, the catecholamine producing cells[23, 24]. Furthermore, a previous report showed very weak GR staining in classical pheochromocytoma tissues. Finally, it was shown in pheochromocytoma from MEN-2 and von Hippel-Lindau Syndrome (two rare genetic endocrine conditions being differentiated by their phenylethanolamine N-methyltransferase (PNMT) status and for which GR is known to be involved), that GR mRNA and protein expression did not differ between these 2 types of disease. Accordingly, we propose the increased GR expression reported in ourpatient maybe specific to thissubtype of pheochromocytomatumor. To integrate these results with potential functional activity of this tumor, animal studies have shown thatendogenous glucocorticoids are important modulators of catecholamine synthesis[26-30], that GR-deficient mice secrete lower levels of catecholamines, that exogenous glucocorticoid administration increases catecholamine-dependent enzyme expression and accelerates catecholamine secretion in a pheochromocytoma cell line, and thatGR exerts functional activity in the adrenal gland as dexamethasone transactivates the GR-element luciferase reporter gene. Thus, taken in combination, results from the literature and our results suggest that GR are present in chromaffin cells and further expressed within steroid-modulated pheochromocytomas. While this hypothesis is to be further explored at the cellular level, we propose that in this subtype of pheochromocytoma, increased GR expression may mediate tumor sensitivity to glucocorticoid and trigger catecholamine synthesis, production and release. Although our study hasmany strengths such as it is the first to provide a molecular demonstration of GR expression in comparison to normal tissue,it also has some limitations.It would have been worth comparingGR expression between thesteroid-modulated pheochromocytoma, its residual medulla and a classical pheochromocytoma. However, because of the large size of thetumor described, no residual medulla was detectable in the specimen. Also at the time of this study, no classicalpheochromocytoma exposed to steroid in the year preceeding surgery was available for comparison. Considering the reported cases of corticosteroid-induced pheochromocytoma crisis and the present molecular demonstration of increased expression of glucocorticoid receptor in the patient’slesion, corticosteroids should be on the list of potential trigger of pheochromocytoma crisis as previously proposed[6,21,33].Accordingly, several recommendations for practice, which havebeen formulated[4,13,21], are to be reinforced with the present study findings. First, while investigatingadrenal incidentalomas, pheochromocytoma should be first ruled out with catecholamine measurementsbefore performinga high-dose dexamethasone suppression test. Second, in patients with concurrent adrenal mass and allergy to contrast media, careful exclusion of pheochromocytoma should be performed before corticosteroid administration. Third, clinicians should entertain the diagnosis of a pheochromocytomawhenever a patient presents hemodynamic instability, shock, an arrhythmia or cardiac ischemia after corticosteroid administration. The authors would sincerely like to acknowledge the collaboration and implication of Pr. Nicole Gallo-Payet (Department of Medicine; Division of Endocrinology; University of Sherbrooke, Qc, Canada) to this paper with regard to result discussion and critical review of the manuscript. The authors would also like to acknowledge the collaboration of Pr. Jean Setrakian (Department of Medicine; Division of Internal Medicine; University of Sherbrooke, Qc, Canada) to this paper with regard to critical review of the manuscript. The authors would like to thank the Human ethical review board of our institution for their rapid acceptance of our project. This study was funded by investigators personal financial support. Manger WN. Gifford RWJr(1996) Origin, pathopharmacology and pathology of pheochromocytoma. In: Manger WN ed. Clinical and Experimental Pheochromocytoma. Blackwell Science Cambridge, MA, USA: 335-339. ©2016Dupont MF.This is an open-access article distributed under the terms of the Creative Commons Attribution License, which permits unrestricted use, distribution, and reproduction in any medium, provided the original author and source are credited. Department of Medicine, Division of Internal Medicine, Université de Sherbrooke, 3001 12th North Avenue, Sherbrooke, QC J1H 5N4, Canada, Tel: +1 819 346 1110, Fax: +1 819 820-6406.